NO ROAD TOO ROUGH, NO JOB TOO TOUGH! Stuck in the middle of nowhere? You don’t need to wait long for someone to help you. Get reliable towing and auto solutions from Coulter’s Towing, a reliable towing company in Bardstown, KY. We offer a wide range of roadside assistance to help you get back on the road in no time. From tire change to fuel delivery, you can count on us to efficiently address your concerns. Why Choose Our Towing Company? 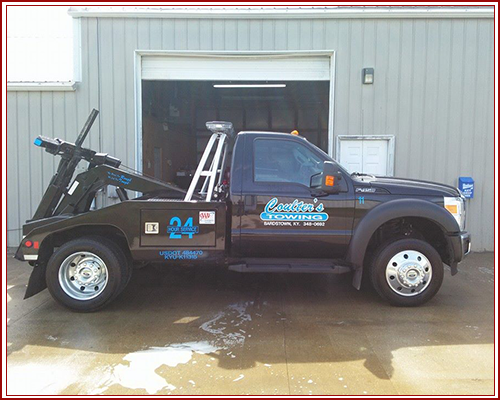 Our towing company is committed to providing you with the assistance you need any time of the day. We know how important your time is, which is why we make sure to finish the job in a professional and prompt manner. Make us your preferred towing company! Contact us using the number listed on this website to learn more about the roadside assistance we offer.